Following a very serious flood last winter, our client took the opportunity to replace some of their equipment. The first steps were to replace the powder booth and curing oven. 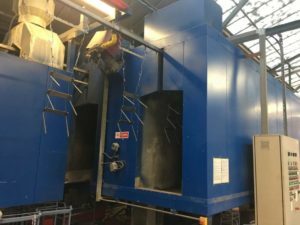 The original plant utilised an off-line camel back oven, which required additional manual intervention during the coating process. As well as serious inefficiencies the process introduced risks to the final finish of the product. Arising mainly from the additional handling of the coated items before curing. The advantages of online powder coating take many forms, but the lack of mechanical intervention once placed on the line is a significant one. From both a production efficiency as well as product finishing point of view. The new conveyorised powder coating oven was built off-line and a new track extension was installed. This allowed for only a very short break in production when the new section of track was connected in to the original. As well as being more modern, efficient and safer, the optional internal stainless-steel finish improves the aesthetic of the oven as well as ensuring its longevity. The client then needed to replace the drying oven whilst also working through a busy period of production. This was trickier as the existing oven was on-line and still in use. There was a requirement to prevent a significant amount of down time. Meaning the replacement oven would have to be installed during a very short window. Having shut the factory for 11 days, TD were able to remove the existing drying oven and install the new system without fault. The drying oven, like the curing oven was supplied with efficient, modern fans and gas burner. The modulating gas burner was supplied with an up to date controller unit. This allowed us to modify the existing control panel and upgrade from the original hi/low burner type on the old oven. The ovens are now commissioned and up and running with enhanced performance, reduced waste and energy usage. Another satisfied customer. If your company could benefit from replacing or upgrading their finishing equipment. Whether it be a drying oven, curing oven, wet paint or powder paint facility. Then, why not contact us today to discuss your requirements on 0121 520 8884 or email andrew@tdfinishing.co.uk. If you enjoyed reading this article you may also like to read our previous post on pretreatment systems.